Gardening in raised beds had lots of advantages. It certainly contains the garden; improves its appearance; and makes accessibility easier. I liked the idea of having pathway and place to sit while tending to the crops. 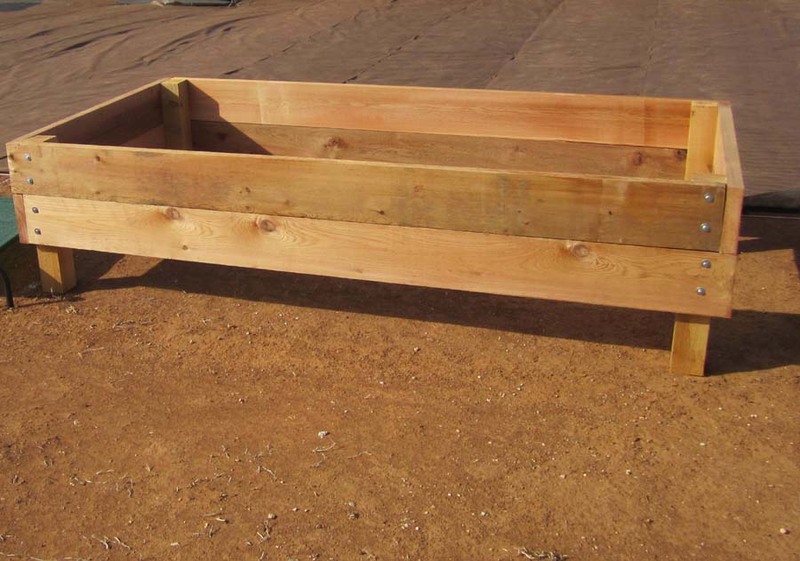 I've gardened in raised beds for years and prefer this method. I want to produce enough veggies for consumption and also for canning, freezing and/or preserving. In 2011 my attempt at growing veggies was a dismal failure - we arrived too late to start a garden and it was blazing hot all summer. I sowed seeds anyway in the area gardened by the previous owner. Most seeds didn't come up; the tomatoes plants didn't produce; my only harvest was one (excellent tasting) kohlrabi. 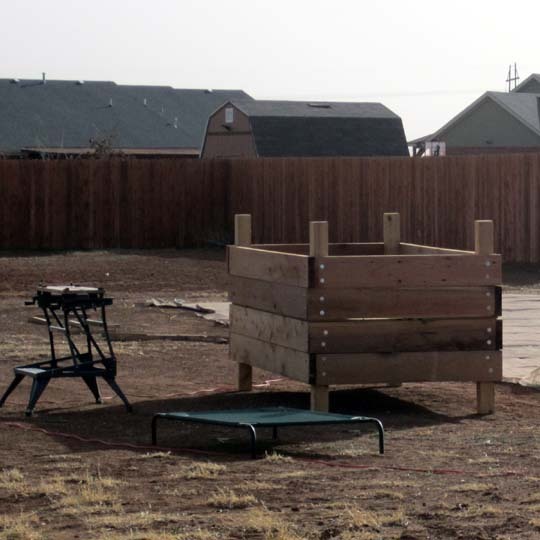 My goal for 2012 was to get the raised beds done and have "seeds in the ground" by the end of March. pulled out Bermuda grass roots. This is our Electric Troy-Bilt Tiller. We refer to her as "Phyllis Tiller." Ordered 2"x8"x8' and 4"x4"x8' rough cut cedar from Lowe's. Also order Grand Empire decorative fencing to enclose the beagle's backyard. Lowe's delivered both. Each layer was clamped in place. 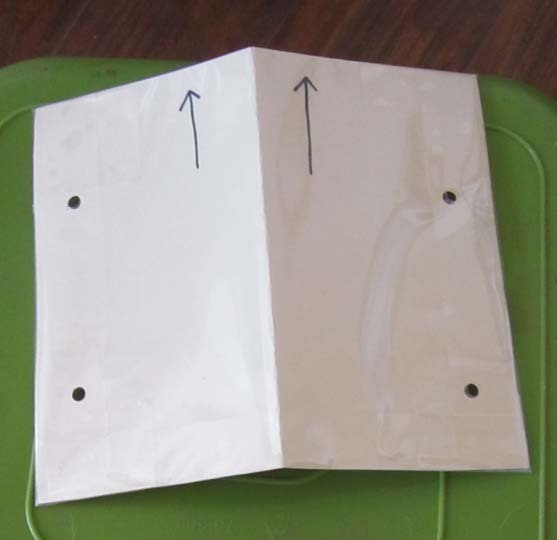 Laminated template used to drill holes for the lag screws. 6 cedar - 8' 2"x8"
Finished box measured 8' long; 4' wide; 16" height. the exposed 8" footings were buried. We converted the first bed into a work table by placing a 4'x8' plywood sheet on top. That made construction much easier. We started erecting the beagle fence too. sand & landscape fabric was secured with staples. All this in an attempt to prevent grass from invading the boxes. holes were dug to accommodate the legs. There is a 3' path way between each bed. the first 3 boxes in place and 4 more were completed. 13 completed frames (picture taken 2/22/2012). Placed first row of 3 are E/W. The remaining beds, 5 in row, are N/S. By the end of March 2012, all 20 were completed & planted. How did I determine how much garden soil will I need? Basic math comes to play here. First I have to determine the total volume of each bed. 4' (Width) x 8' (Length) x 1' (Depth) = 32 Cubic Feet. For the record, 27 cubic feet = 1 cubic yard. Because I am building 18" deep beds, I will put landscape fabric in the bottom of the boxes. I am trying my best to prevent Bermuda grass from growing up in the raised beds.